Well, five years later I still have the same passion for the movie that garnered the top spot on that list. In fact, believe it or not, my love for the movie has grown even more. This says a lot coming from a guy who usually can only stand to watch a movie once. Last week the film was on television once again. Sidney and I couldn’t resist watching it. Although it was probably the 557th time I watched “Forrest Gump,” I probably laughed and cried as much as ever. While watching it last week, it became obvious that I had to write about it again. For today’s blog post I want to share the top ten reasons why I love “Forrest Gump” so much. Forrest Gump is a masterpiece and I have ten major reason why I like it so much. 10. Savannah – The city of Savannah is special to me because Sidney and I went there for our one-year anniversary. It is a great and beautiful American city with an incredible history. Savannah is home to several historic parks right in the heart of the city. One of these parks is the setting where Forrest sat down to catch the city bus. Of course it is where he told a large portion of his story and he uttered his famous “Life is like a box of chocolates…” line. Because the movie reminds me of our one-year anniversary and because I had the opportunity to visit the bench spot, it serves as a good reason for why I love the movie. 9. The Unbelievability – “Forrest Gump” combines actual historic events with things that are borderline unbelievable. Although I prefer non-fiction, I still love the story of Forrest Gump running across the country twice, mowing a lawn for free, and making it to the White House based on his own merit three times. 8. Acting – The acting in “Forrest Gump” is incredible. Although I am especially partial to the way that Forrest and Lieutenant Dan are portrayed, the whole cast turned in memorable performances. But why do I have acting so low on the list? How could I make acting #8 when Tom Hanks won the Oscar for Best Actor? It is because, for me, the movie is so good in so many ways that acting simply doesn’t take one of the top spots. 7. The Way the Story Is Told – I love the unique way in which the events of the movie occur. It starts off in the present as Forrest is sitting on a bench. He then reflects on his past. However, the movie doesn’t end when he tells his whole story. Rather, he leaves the park bench and goes to find Jenny and the movie goes on for another hour. I think the non-chronological way in which the movie was made is extremely creative. And they go on and on and on. “Forrest Gump” introduced so many phrases and humorous one liners into our lexicon. When watching the movie, you can’t help but say them with the characters. Over 22 years since the movie was made and many of the one liners are as popular as ever. 5. Watchability – As I mentioned in the opening, there is not another movie I can easily re-watch more than “Forrest Gump.” If I turn on the TV and it happens to be on, it doesn’t matter what point of the film it is in, I can easily just start watching it. When adapted for television, the film is three hours long. If I am fortunate enough to catch “Forrest Gump” as it starts, I will devote the full length of time to watching it. The movie is just so smooth, so fun, and so gripping that I can’t turn away. 4. Emotional Moments – I hate to admit it, but “Forrest Gump” makes me cry…a lot. The film contains so many scenes that just get you. From Forrest putting his head down on his mom before going off to Vietnam to Forrest seeing his son for the first time to Jenny and Lieutenant Dan meeting at the wedding your heart is tugged so many times. The movie makes me feel some type of way. 3. 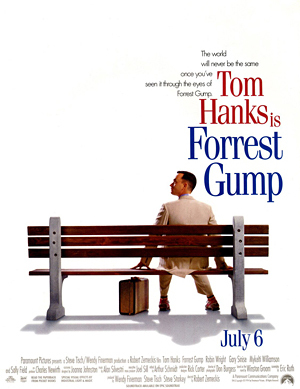 The Music – First off, “Forrest Gump” uses some of the iconic songs of American music throughout the movie to signify the current era the film is in. The makers of the movie did this in a superb fashion. In fact, many classic American songs from the 1960’s – 1970’s that I hear today immediately remind me of “Forrest Gump” simply because they were used so brilliantly in the movie. However, it is the original instrumentals in the movie that stand out to me the most. From the triumphant melody played when Forrest breaks out of his leg braces to the soft instrumental that is played throughout the whole movie, these unique pieces bring emotion and harmony to the film. It really is a thing of beauty. 2. The History – The movie “Forrest Gump” is a history lesson. World events, public figures, and American attitudes are presented throughout the entire film from the perspective of the lead character. The music, the actual historical footage, and the cinematography all lead to a genuine and fascinating look at the United States of America in the mid to late 20th century. As a history buff, I genuinely appreciate the heartfelt and humorous look at our past. 1. The Writing – “Forrest Gump” is just beautifully written. While I understand that the film was first a book, the way it was adapted for the big screen was phenomenal. I can lay in bed and close my eyes and listen to the movie and just feel great and peaceful. The narration is soothing, funny, and beautiful. You can watch a scene from the movie and just blurt out loud, “Man, that was just described so well.” Go ahead and take away the music, the actors, and the cinematography because “Forrest Gump” will still stand as a masterpiece based on the writing alone. Can you tell I like this movie? “Forrest Gump” is an American classic and I think history classes should show the film. However, if you are a teenager and your teacher hasn’t played it for you yet, do yourself a favor and watch it on your own couch. Don’t Blink. This entry was posted in Uncategorized and tagged Forrest Gump by brent. Bookmark the permalink. R y’all ok ? Did u have to evacuate?